If there’s one thing that One Fat Frog loves more than food, it’s helping others. We really get excited about any opportunities to help others with food! For that reason, One Fat Frog is pleased to tell you about our partnership with Golden Corral to hand out meals on Thanksgiving. On Thanksgiving, the popular restaurant chain will hold its 21st Annual “Helpings from the Heart” Thanksgiving dinner. The company, led by president Eric Holm, will give away meals at the Salvation Army Gymnasium located on West Colonial Drive in Orlando, Florida. They are expecting to serve more than 25,000 meals on the holiday, helping provide a little Thanksgiving to individuals and families that can’t afford to buy and cook their own meals. Last year more than 1,000 Salvation Army volunteers served at the event. A similar turnout is expected this year, where a buffet line provided by Golden Corral will serve turkey, stuffing, pumpkin pie, and other Thanksgiving meal staples. The equipment used to cook and serve the meals was provided to Golden Corral by your friends at One Fat Frog. Holm knows how important a Thanksgiving meal can be to a struggling family. When he was a child, his own family had Thanksgiving courtesy of the Salvation Army. Since becoming a successful businessman, Holm has been a big supporter of the Salvation Army, on Thanksgiving and the rest of the year. “On one of the biggest eating holidays of the year, we feel blessed that we can not only share in the experience, but most importantly ensure our Central Florida community is fed,” Holm says. 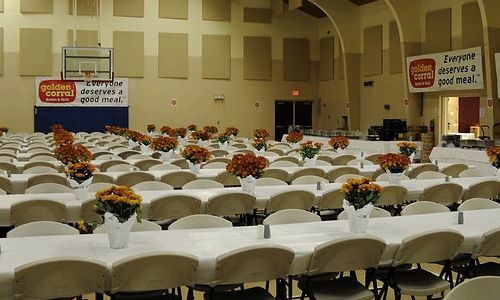 The Helpings from the Heart Thanksgiving Dinner will be from 11:00 am to 5:00 pm on Thursday. The Salvation Army is located at 440 W. Colonial Drive, Orlando, FL 32804.